Windows Vista Aero Glass transparency effect has greatly enhanced the visual effect and user interface of Windows Vista by making the border of the windows on screen translucent, or half-transparent effect. However, the Aero Glass transparency effect is gone once the window is maximized (border becomes opaque solid color). In order to maintain the transparency effect even on maximized window, a third party utility has to be used. 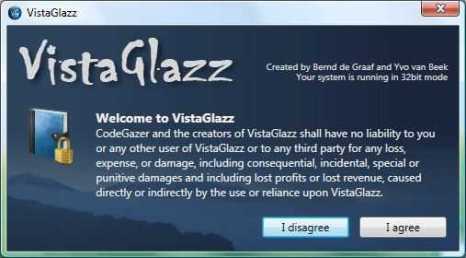 VistaGlazz is a utility tool that able to ensure and force Aero Glass transparency effect, even on maximized windows. The only caveat emptor is that user’s system must support and enable Windows Aero feature. VistaGlazz supports Windows Vista RTM and Windows Vista SP1. To run VistaGlazz and apply the patch, install VistaGlazz and then run the application with administrator’s privileges. Firstly, users have to press on “Patch System” button to patch system files. What it does is to backup and then patch some system DLL files in order to bypass and skip security mechanisms in Vista that check the source of a visual style that forbids or prevents a visual style that is not created (signed) by Microsoft to load (instead, it will fallback to Windows Classic appearance), in order to load whatever visual style user prefers. Restart computer. For user who want to fix and patch the Windows Aero style for more transparency effect, run VistaGlazz again, and then click on “Patch Style” button. VistaGlazz will patch Windows Aero style and restart the Windows Desktop Manager (WDM). Your screen will flicker for a moment, and while WDM is restarting, your desktop may lose its transparency. Again, full backup copy of Windows Aero style is made for easy restoration. Once patched, all windows, be it maximized or snapped window or normal window will have Aero Glass transparency effect around the borders. As AeroGlazz already patch the theme-related DLLs, users can also make use of custom theme visual styles too. Tip: To restore or revert back to original system default, click on the “Patch Style” or “Patch System” button again to unpatch the style files or system files.